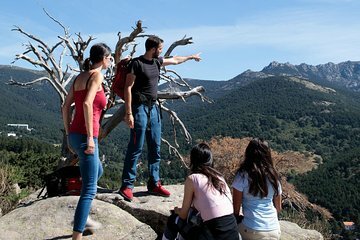 Verlaat de stad achter je en ervaar de natuur in de bergen van het nationale park Sierra de Guadarrama op deze begeleide wandeling van een halve dag. Loop rustig door het bos en voorbij de boomgrens en zie de enorme bergketen de horizon vullen. Maak kennis met de natuur en geschiedenis van dit natuurlijke landschap en bekijk stieren, paarden en andere dieren die hier leven. I decided to try this hiking while in Madrid because I wanted something else apart from museums and flamenco, and it ended being great! Nice hiking through Madrid gorgeous mountains, they are very close to the city, and we were lucky because we were able to have the company of a rescue dog with us. Marcos explained the history of the area, the plants and trees and made the hike relaxed and for me it looked like walking with a friend thanks for everything!! Great break from city heat and bustle. Pretty landcapes and modest hike at leisurely pace. Guide was friendly and english was excellent. Just do it! I was wondering if I could be able to visit some nature while in Madrid and I am glad I found this hike! Amazing views of Madrid mountains and great company made it really special. We walked around 3 hours in an easy and beautiful hike while discovering Madrid forests with its history and animals we saw cows very close and pet horses. Drank from spring water and also saw the mountains and some towns from a top view and knew a bit more about locals while resting. After the hike, I asked for a restaurant in the area and surprisingly, found out it was the best food I tried in Madrid and very cheap! Thanks for the morning hiking in Madrid mountains, adding some nature to my trip.